MANALAPAN, N.J. — Sitting courtside about a half-hour before his Dream Phenoms were due to play ball on one of the four upstairs courts at the made-for-hoops Sportika facility just off the New Jersey Turnpike, Jon Michels called over a guard who had been with him for seven years. Michels knew his guy wasn't happy with his playing time the day before. "How did you think you played?'' Michels asked. Their frank discussion continued, the coach doing most of the talking, how a strong game had been followed by an uneven game, the playing time reflecting it. Michels had a point to make: A junior college assistant might be here just to watch you. Don't let your body language send the coach away. For three decades, Michels has been having these kinds of talks with hundreds of area ballplayers. If you think AAU means John Calipari and Jay Wright sitting courtside, you're thinking of the tip of the iceberg. This Elevate Hoops event last week had a slew of college coaches watching. Judging by the logos on their shirts, they were all Division II and III and junior college coaches. The plan to have the NCAA and USA Basketball take over the summer next year probably won't help his guys, Michels said. "If they shut the live period down in July, then it takes opportunities away from our guys,'' Michels said. Maybe Michels says this every year, but this man who is one of the more recognizable faces on the year-round local hoops scene is seriously thinking this might be his own last summer of coaching. He is 51 and has been at this in various ways for three decades. "I grew up in the Northeast,'' Michels said. "My dad grew up in Strawberry Mansion, went to Gratz, grew up with Bill Ellerbee, Alvin Williams Sr. … I kind of got the history of Philadelphia basketball pushed at me, in a good way." Michels coached junior-varsity hoops in Bucks County, "was always around rec centers," and had a program at the Boys and Girls Club in Camden, then at a Salvation Army facility in Levittown. He coached at Widener under current St. Joseph's assistant Dave Duda, coached Tacony Academy Charter for a year, and now is the under-19 coach for Costa Rica. In the meantime, he's had his own travel team for the last decade. 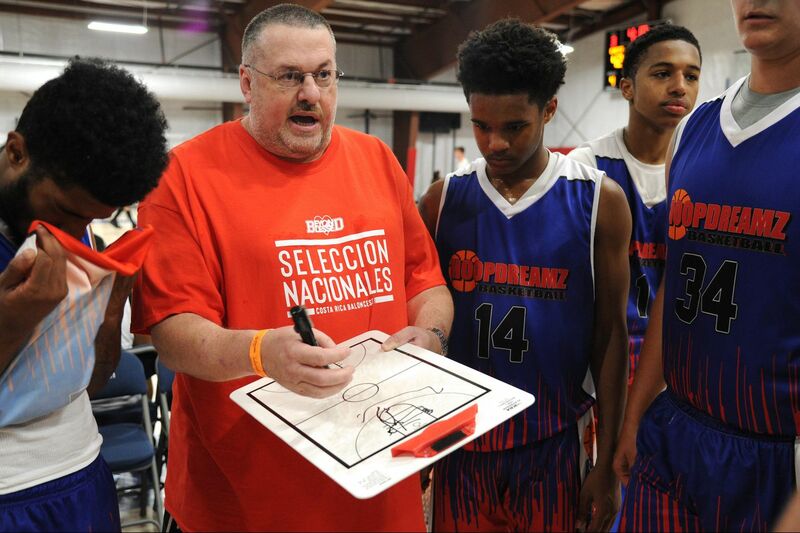 It was called Hoopdreamz, now Dream Phenoms, as he joins up with another local hoops vet, Paul Gripper. There's no shoe company affiliation. The swoosh on the T-shirt Michels was wearing this afternoon just came out of the bureau. Jon Michels, who thinks he is going to stop coaching travel-team hoop coaching after 30 years, wore comfortable sports slide sandals courtside last week at the Elevate Hoops event in Manalapan. "Our AAU program has lost money every year for the last 10 years,'' Michels said. "I can't tell guys you don't have it [money], you can't play this year. Some are really good; some are the ninth guy." None of his players seemed put off by what Duda calls Michels' "old-school mentality" when it comes to the game. "Don't help at the foul line,'' he yelled at one perimeter defender, not wanting to create an opening on the wing. Managing expectations is part of his job, since all the players tend to think they've got what it takes for the big time. "I had a kid in my program who came off the bench as a junior for an average Division C Public League team, and he wanted me to call Villanova for him,'' Michels said. "I think it happens a lot more than it used to." In this game, his team moved on as everyone contributed, led by strong play inside from Neumann-Goretti stalwart Ja'Cor Smith and timely moves by all-Pub rising senior Scott Spann from Sankofa. The group included players from Father Judge, Penn Charter, Bishop McDevitt, Archbishop Ryan, Lincoln and Abington. Dreams are all right. Michels always had it on the name of his team. He's had plenty of D-I guys, too. Clifton Moore didn't have any D-I offers going into the April live period his junior year at Hatboro-Horsham. The offers began coming in from the likes of Lafayette and George Mason. "By the end of July, I had every school calling with the exception of Duke, North Carolina, Kentucky, that level,'' Michels said of the 6-9 forward who just finished his freshman year at Indiana. One point is that under new rules, college coaches are supposed to list whom they want at top summer events. Would Moore have even made their lists? Michels said he is ready to be off the bench, to still be involved, just not coaching six games a weekend. He enjoys the Costa Rica experience, which evolved from taking his own team down there. If he turns in his coaching sandals and his place on the travel-team bench, it will partly be to spend more time with his daughters after coaching his son, now a reserve for Division III Rosemont who has seriously caught the coaching bug. Let's see if he can tell his guys he's done. "We don't have a kid in our program we wouldn't want in our house,'' Michels said. As a college coach, he recruited New York and Baltimore guys. "Philadelphia is very, very different than those cities," Michels said. "For a huge city, it's a very small basketball community. It drives me crazy sometimes because the basketball community will eat their own, but they won't let anyone else eat at their table." By that, Michels said, he means "they all hated each other at the Sonny Hill League, wouldn't say hello to each other. The first thing at [national tournaments], no longer in Philadelphia, they said they want to go watch the others from here. It's a very unique place." And the veteran coaches tend to tell it like it is. "Put some ice on that," Michels said after the game to a guard who had banged up his leg. "I don't want to get a text from you in the morning saying, 'I can't go.' "
Michels says he is ready to be off the bench, to still be involved, just not coaching six games a weekend. Howie Roseman has a type in the NFL draft. What does that mean for Thursday?